EP05 – April 29, 2017: One of a Kind Furniture and More! 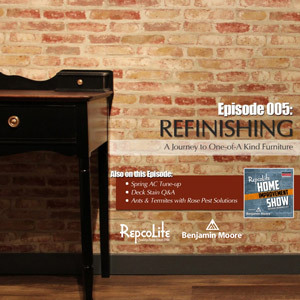 Today, we sit down in the studio with Kim DeBoer and discuss the adventures of refinishing furniture. Kim talks about some of her best experiences and the joys of taking something old and unwanted and turning it into a centerpiece in your home! That and more in today’s episode of the RepcoLite Home Improvement Show! Shopping for furniture to refinish or repurpose can be stressful! What's worth buying? What can actually be refinished and what is just going to make you sad? And where do you look to find these pieces? Kim DeBoer is a professional painting contractor who does a lot of furniture refinishing on the side. She's been doing this for years and has answers for all of these questions and more! It's Spring and the weather's getting warmer! And that means that we're right on the cusp of air conditioner season. But did you know that there are a few simple projects you can tackle on a Saturday morning (or anytime!) that will help you make sure your unit runs efficiently, for less cost, and lasts longer! Today we go over the 2 must-do jobs this Spring! Staining a deck is a great project! It's fun and even relatively easy. In fact, the most confusing part of the whole project is trying to choose the right stain. Should you go with an oil-based product? Or a waterborne? What opacity is best for your situation? Clear or Solid or something in between? On today's Ask RepcoLite segment, we've got all the answers! Spring is here and with it, we get warmer weather, baseball . . . and ants! My home is right now under invasion and so I'm very excited to be in the studio with David Popp from Rose Pest Solutions. He's here to talk about ants, termites, what to look for and what to do when you find a problem! EP04 - April 22, 2017: Painting Vinyl Siding and More!